PR Can Be Stressful – Here are 5 Ways B&O Is Reducing the Strain…. Did you know that public relations executives have the 6th most stressful job in America? Under constant pressure and tight deadlines, it’s no secret that PR professionals feel overwhelmed from time to time (insert that collective SIGH here). So how can we learn to manage stress, avoid mental fatigue, and be happier overall at work? You might think a viable solution to preventing all this stress would be to plan ahead and predict our daily schedules more effectively. But PR is a spur-of-the-moment industry, and the need to manage a constantly evolving news cycle often prevents said planning from happening in an organized fashion. Hence, it’s critical that PR workplaces continually seek out creative ways to help combat stress. Stopping mental fatigue – a phenomenon caused “by an inability of the fatigued subject to allocate attention efficiently” (ERP study) – and stress in their tracks is where PR professionals need to focus their energy. “It’s preventative medicine,” said Jane Buckingham, CEO of trend forecasting and media firm Trendera in a recent Adweek article. 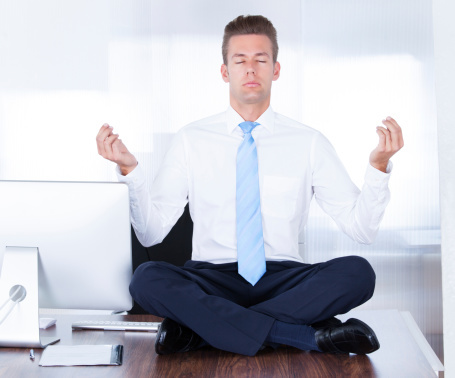 “Studies show that meditation and living healthy lives make people more productive. They’re less frazzled by heavy workloads; they’re less likely to be overwhelmed…” And they’re therefore more likely to jump on tasks faster and with more energy and eagerness than before. Bouncy exercise balls and standing desks: Along with reducing stress, bouncy balls and standing desks can give you a break from the evil desk chair, which can literally kill you. The Washington Post released a troubling article last year detailing the excess of health problems desk chairs cause including heart disease, over productive pancreas, colon cancer, muscle degeneration, poor circulation in legs, soft bones…to name just a few. Bouncy balls reduce mental fatigue by forcing muscles to balance and thus pump fresh blood and oxygen through the brain, reducing brain fog. Fast Company’s recent scientific research on standing desks indicates they have resulted in some clear physiological health benefits, including increased energy expenditure and an average heart rate increase of 8 beats per minute. Not to mention, they are simply fun and often the source of other workplace hijinks – including bouncy ball basketball. Encouraging stress-reducing moments in daily PR life: Yes, we are all super busy, but taking a few minutes to regenerate can pay off when it comes to boosting productivity and creativity. And that’s exactly why we have massage days every couple of months. To say they are popular would be an understatement. Not to mention, we are huge fans of an afternoon run for coffee, iced tea, whatever your pleasure. But really it’s less about the drinks than the stroll out in the fresh air and the conversation with colleagues that rejuvenates you and gets you ready for that next task ahead. Lastly, it is not uncommon to see that all office email go around with a hilarious cat or goat video. After all, nothing lightens the mood or brings a laugh like goats dubbed into Taylor Swift videos. Plan fun activities employees can look forward to: Good, clean happy hours … a definite key to reducing stress. While Inc. goes so far as to say beer can make you smarter, the #1 reason to plan these events is so employees have something fun to look forward to when moments of stress kick in during the workday. Aside from happy hours, B&O is known for its legendary events – from Valentingo to St. Patty’s Day Olympics. WFH Fridays: Ah, it’s just before the weekend, so what better reward after a long week than to stay home and complete your work from the comfort of your own place? Working from home eliminates the commute, traffic, and provides employees with that work/home balance they crave … not to mention the option of staying in your pajamas until noon and working alongside your pet is always a priceless benefit. Monthly Fitness Reimbursement: It’s no secret that gym memberships can prove expensive, and while the benefits of reimbursing employees for monthly gym fees are clear, employers benefit as well: when employees exercise and eat better, morale improves, productivity increases, and healthcare costs go down. These are just a few of the great perks that accompany B&O’s fantastic wellness and healthcare benefits. And one thing is for certain: the implementation of these initiatives is crucial to our success in this constantly changing, fast-paced world of PR that, for better or worse, we love.